Quick and simple recipe for chocolate peanut clusters that taste JUST like Mr. Goodbars! So, I was eating a Mr. Goodbar the other day and was like this is just chocolate and peanuts. I could totally make these. I remembered a recipe I once had where you used peanut butter instead of oil to soften chocolate chips for recipes like this and thought I would give it a whirl. I like to use chocolate chips. I know a lot of folks use almond bark or candy coating but I've always found them to be kinda waxy and flavorless. 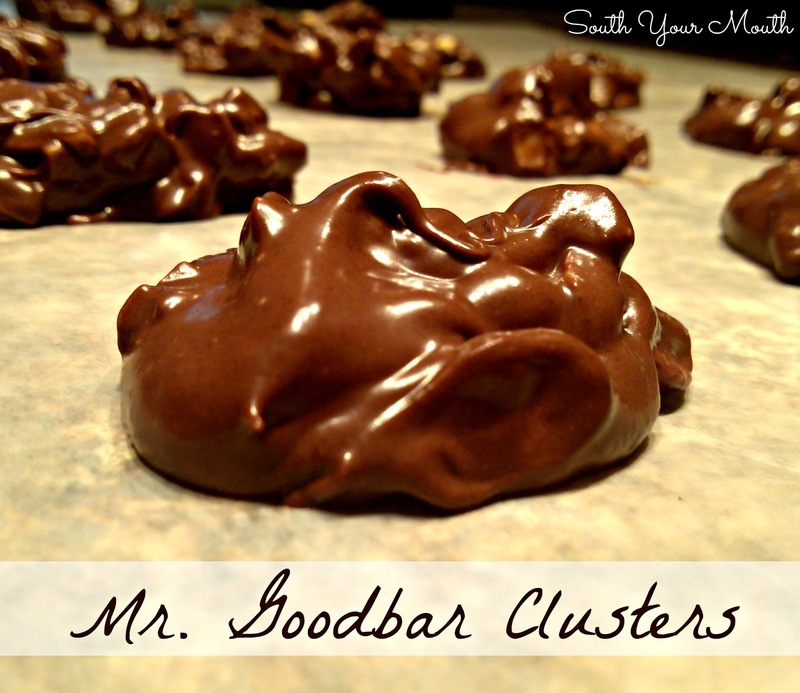 And you don’t have to mix the milk chocolate and semi-sweet (you can use one or the other) but I really think the combination nails the Mr. Goodbar taste! If you decide to use all milk chocolate, omit the peanut butter – the milk chocolate is soft enough without it. Using a large knife, chop peanuts (you’re roughly looking to bust a whole peanut into quarters). Don’t use a nut grinder for this or the texture will be too fine. Set nuts aside. Melt semi-sweet and milk chocolate chips in the microwave or using a double-boiler until completely melted and smooth. Add peanut butter and stir until completely incorporated. Add chopped peanuts and stir well. Drop by the tablespoonful onto wax or parchment paper. Let clusters set until firm (about 8-10 hours). You can speed this up by putting them in the refrigerator but they will sweat a little when you take them out which will mar up the smooth chocolate finish. This reminded of the recipe I make for homemade "Nutchos". Thought I would share with you in case you would like to give them a whirl someday! Melt chipits in microwave. Stir and add potato chips and peanuts. Spoon into miniature paper cups or drop by large spoonfuls onto wax paper. LOL! Chipits - Canadian brand of chocolate, butterscotch, peanut butter chips. It's funny that we have so many different names and words for the same things! Oh WOW! That shiny chocolate grabbed me F-A-S-T! Lovely creation. I'm sure it's just as tasty too. Thanks so much for sharing at Weekend Potluck. Hi! My large family and I have been making batch after batch of these ever since you posted them, wanted to say- thank you!! My 8 & 9 year old daughters love being able to make a desert recipe that everyone loves so much. Also wanted to let you know that one day we decided to add in some raisins and oh my gosh, we loved them even more! They remind me of the "Chunky" candy bars I use to eat as a child, you've got to try it. Plus, it kind of stretches out the recipe to make even more.